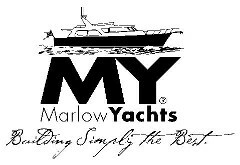 Marlow Yachts appeared on the yachting world's radar with the ME 65, an introduction of our first model series ME65-ME70. This size range has remained extremely popular and had led the industry in fast offshore and very long distance cruising. 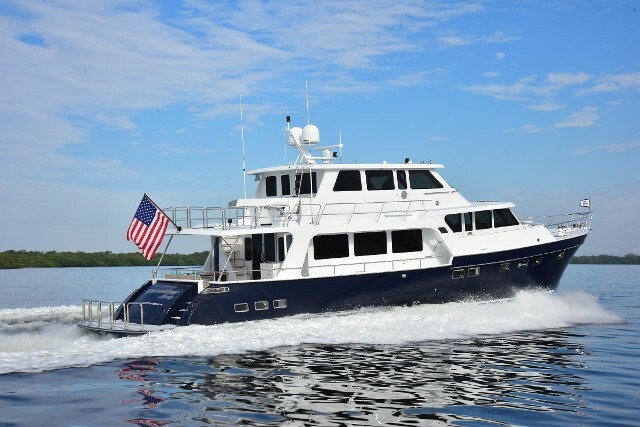 This reimagined hallmark, the ME 70 MKII, was built using all the highly innovative technology we have developed and honed as leaders in the industry and was introduced in 2018 at the Ft Lauderdale International Boat Show. Several special innovations are featured on the new ME 70. The enclosed Command Bridge houses our signature operations center with a full compliment of electronics, large screens and fingertip control of all functions from two pedestal chairs. There is a large L-shape settee and table providing comfortable seating for gathering or dining underway or moored. 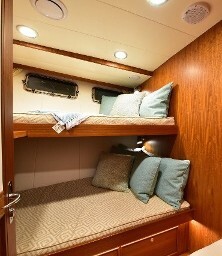 In additon, this model features a comfortable Captain's Cabin with a bunk, hanging locker and drawers for personal items, a desk and refreshment center equipped with a refrigerator and microwave. 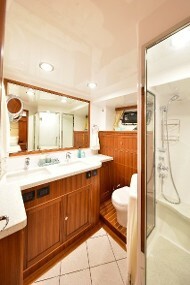 A full head with a large shower completes the layout of this spacious Command Bridge. A door opens aft on to an open upper deck which has refrigeration, a protected dining area, and a on-deck crane for the tender. Innovation comes from continuously trying to create more living space by using high-tech building materials and advanced techniques to create more strength while reducing weight wherever possible. The gain in salon area by changing the engine room vents from horizontal to vertical was remarkable. Another seemingly small change that yielded remarkable results was installing the companionway to the lower staterooms on the port side. This keeps the flow of traffic out of the galley, is more efficient and created enough space to install a beautiful and functional galley island equipped with extra refrigeration and storage. 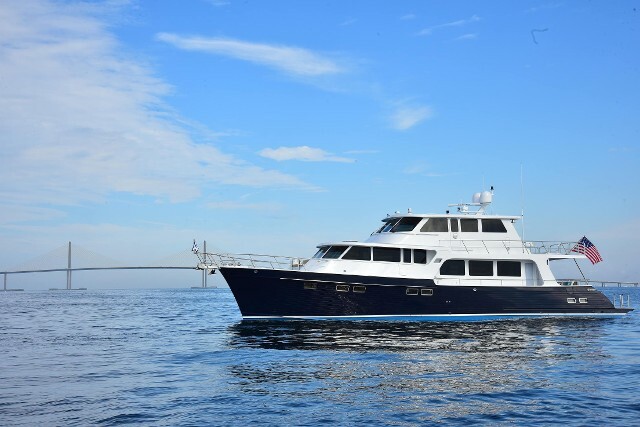 The companionway to the lower deck brings you to a spacious landing where the washer and dryer are hidden in teak cabinetry yet easily accessible to owners and their family or guests. 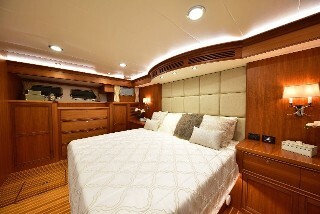 Just aft of the stairs is the midship master cabin, luxurious in comfort and materials with abundant storage and cedar-lined hanging lockers. The master head with double sinks and large shower is bright with a lot of storage cabinets. The VIP with ensuite head is forward in the bow area. It can accomodate two adults in the king sized bed with an upper bunk on each side for a child. 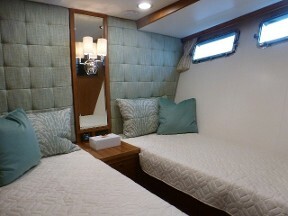 Two more guest staterooms sharing a full head complete the layout. 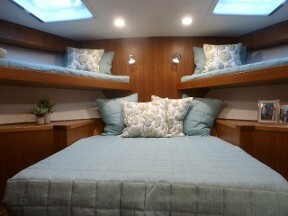 A noted hallmark of Marlow Yachts is the level of finish in all spaces, not just the living areas. 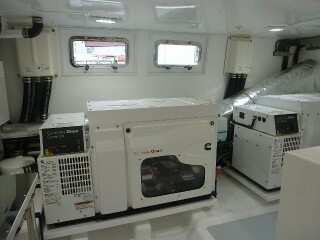 The engine room, mechanical spaces and lazarettes are all smooth and bright. In this model, the generators are housed in their own room with a custom lexan wall resulting in very quiet operation and ease of maintenance. 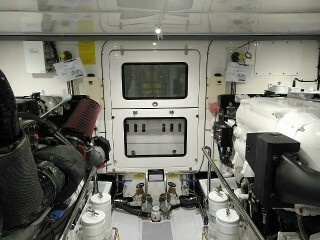 All of the wiring and hoses are neatly tracked, fastened and well labeled throughout the boat. 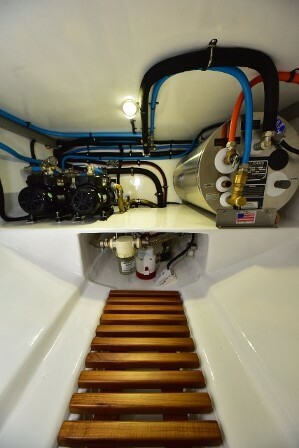 Fuel sight guages mounted for easy viewing, fuel/water separators easily accessed, sea-chest water intake system with two inspection and cleanout ports and a Seakeeper gyro are just a few of the noteworthy features on this yacht. 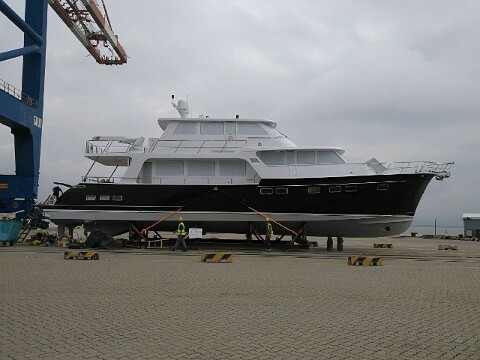 ME 70 MKII at Xiamen Port ready to ship.